Truly Soft Everyday – simple elegance enhanced by double brushed softness. Get better basics for your home from Truly Soft. 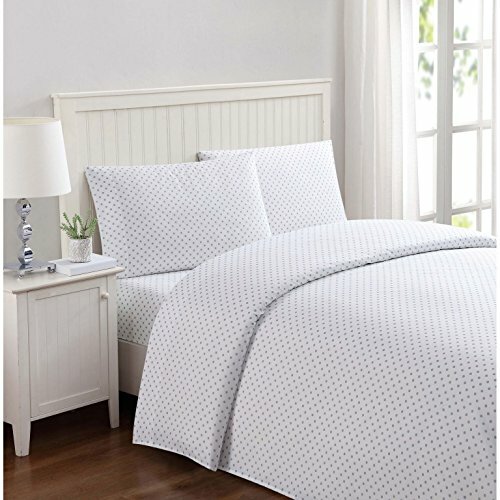 ---- Hypoallergenic, machine washable 100% microfiber that is brushed twice for sincere softness and has a natural resistance to wear and wrinkles, bringing you high quality bedding at an affordable price. ---- Colors that are easy to mix and match. Pair it with a matching duvet, a contrasting pillow case, or a patterned comforter. Smooth colors flow into any room. -- Complete the look with sheet, quilt, comforter, duvet, and bed-in-a-bag sets from Truly Soft. Includes 1 fitted sheet 54x75" with 13" pocket, 1 flat sheet 84x96 inches, 2 pillowcases 20x32" each. Easy to care for, machine washable, dryer friendly, wrinkle and fade resistant, hypoallergenic microfiber sheets. Fitted sheet has elastic all around for a truly snug fit that doesn't move not matter how much you toss and turn. A 13" depth can fit up to a 16" mattress. Little Dots shower this collections of super soft bed sheets from Truly Soft Everyday. Make bed time a little sweeter with the pretty Dot pattern. Truly Soft Everyday - simple elegance enhanced by double brushed softness. Get better basics for your home from Truly Soft.